The Bellingham United team on the line during the outdoor season. Photo courtesy: Bellingham United. It was just six years ago that former owner Jeff McIntyre came to Bellingham to establish a semi-pro soccer squad. 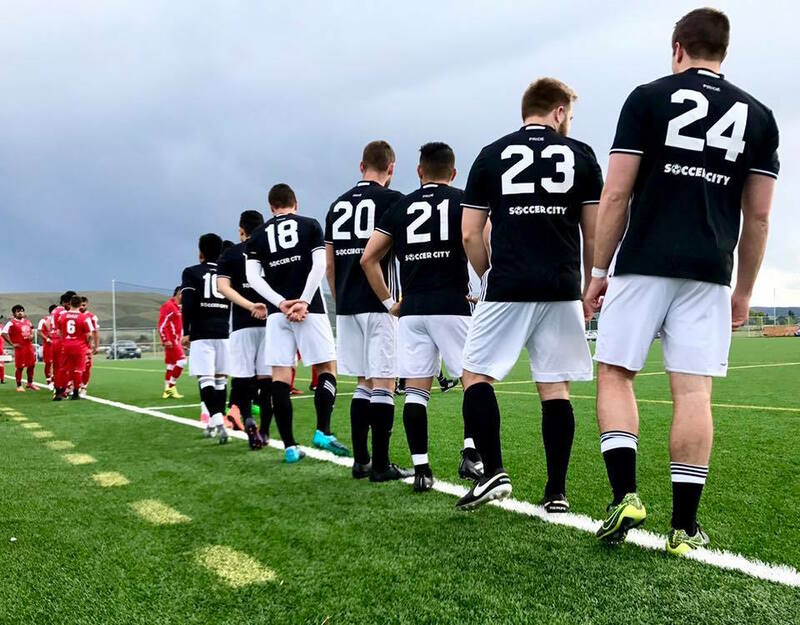 Whatcom Sports & Recreation’s Executive Director, Lance Calloway, connected with McIntyre to become involved in the project to bring higher level men’s soccer to Whatcom County. From that moment forward, Bellingham United has paved the way for the growth of soccer in Whatcom County. Bellingham United teammates huddle during a game. Photo courtesy: Bellingham United. Calloway has served as the head coach for the past six years with the team playing Canadian teams in the long-established Pacific Coast Soccer League in British Columbia for the first two seasons. At the time, organized Washington team leagues were limited. Although this didn’t stop the Bellingham United team from playing strong and creating a solid connection with our local community. In their third year, Bellingham United were key facilitators in the formation of a new league, the Evergreen Premier League. This includes eight teams from around Washington, from as far away as Spokane to as close as Seattle. “While we’re mostly made up of local college players who either came back to Bellingham or who currently or used to play for Western, we’ve got a lot of growth in kids coming here from other locations,” says Marc Ronney, General Manager. Ronney goes on to describe the distance some of the players travel to play with Bellingham United. Players have come from as far away as New Zealand and Brazil to play with the team. Local players are also strongly represented. “One of our players is a teacher at Squalicum High School,” says Ronney. “And we always try to bring in some of the local kids who are still in high school to train with us.” Currently, a senior from Squalicum High School is on the roster and playing with the team. While they carry up to 40 players on their roster with ages currently ranging from 17 to 32, Bellingham United also has a reserve team. This team plays approximately eight to twelve games a year. It offers a great opportunity for players to get some good playing time and crowds to have even more opportunities to see great soccer in the community. Bellingham United fans in line to meet their role models and get autographs. Photo courtesy: Bellingham United. And, with Bellingham United’s indoor and outdoor seasons, there is ample opportunity to see these committed and talented soccer players play. 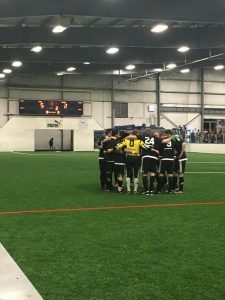 During the indoor season, Bellingham United went all the way to the semi-finals in the 2017 National Championships. The local excitement of such a successful team is seen in the draw of the crowds which reached attendance of 700 during the playoffs. And, as the summer season reaches full swing, the Sunday afternoon games regularly see the attendance of over 300 fans. Being a part of the Bellingham community is at the core of Bellingham United. With the tagline of, “United in Soccer United in Community,” the players live this commitment daily. Living and playing in Bellingham, these soccer players spend time giving back to the community which is an important part of their lives and their teamwork. Even off the field, the players of Bellingham United can be seen in the classrooms of our local schools working with students as a part of the Reading Challenge program. “They are great role models,” Ronney explains. He goes on to describe the scene that occurs after each summer game – kids running to the players after the game to meet them and get autographs. Bellingham United brings the excitement of soccer to the community. 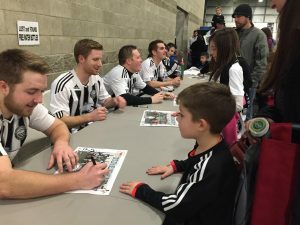 They also bring a feeling of connection between these semi-pro players and the younger, hungry-to-learn kids eager to be a part of something bigger. To catch a game, see available ticket packages, the latest news and the current schedule go to the Bellingham United Website.